Hello, I am Marianne Colijn from the Netherlands. 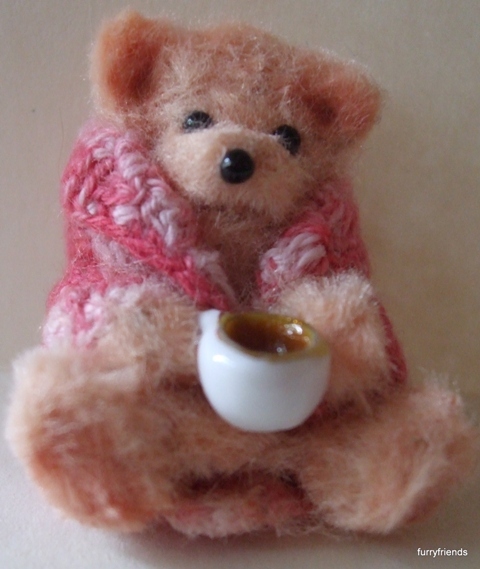 I call my business Furry Friends by Marianne because it all started with my little bears. These days I also make knitted and crochet items as well as polymer free mini food. The Furry Friends are made out of humble chenille stems that I turn into bears using my very own special technique. Every bear is one of a kind because I have never been able to make the same thing twice. I love to dress the bears in tiny clothes when they allow it and I like making little things for them to play with etc. That is how I started to make other minis as well. I have been making bears for about 10 years now and I still have ideas for more bears. I started making these tiny bears when I was at a rehab centre where I did not have acces to interesting materials or patterns for making fabric bears. The chenille stems proved to be a great medium for me and the bears became very popular with the other patients , so much so that I was known as the Bear Lady . A friend placed pics of my bears on a website and people actually wanted to buy the little bears which I found totally amazing. Now my little friends travel all over the world to new homes and through them I have met a lot of very nice people. The bears I make these days are totally different from the earlier ones for I have learned many new techniques . I also love make little Furry Friends in crochet whenever time allows. 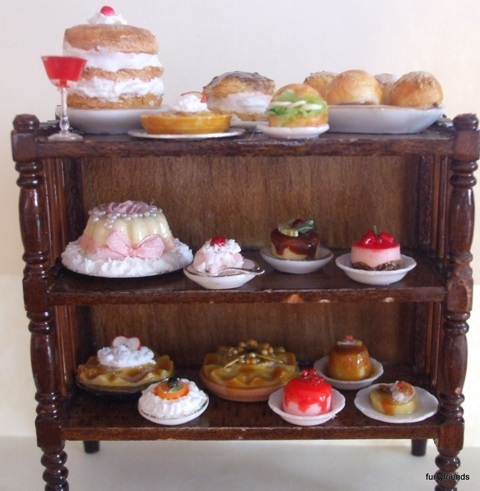 Over the last 5 years I have also been a regular contributer to American Miniaturist magazine. I did desing projects and how toes in all kinds of different techniques and I love the challence of coming up with something new all the time. My bears needed mini food and because I really admire all those talented people who can work with clay that is what I tried to use too. But I soon found that I am totally hopeless with clay. I have tried all kinds of different techniques and over the last year I have been able to make some pretty good food without using any clay at all. I have even been asked to teach workshops about it. I am selling my mini food through my website now and I am planning to do some fairs as well. And I am currently working on a little instruction book that will be available on my website too. My current speciality is cakes , puddings, cookies, different kinds of breads and fruit pies. I am currently developing a range of vegetables and salads. Las tartas te han quedado de lo más apetecibles, estan perfectas. El osito es muy dulce.